The rapid expansion of human activities threatens ocean-wide biodiversity. Numerous marine animal populations have declined, yet it remains unclear whether these trends are symptomatic of a chronic accumulation of global marine extinction risk. The first systematic analysis of threat for a globally distributed lineage of 1,041 chondrichthyan fishes (sharks, rays, and chimaeras) was published in the journal eLife in 2014. ​This paper estimated that one-quarter are threatened according to IUCN Red List criteria due to overfishing (targeted and incidental). Large-bodied, shallow-water species are at greatest risk and five out of the seven most threatened families are rays. Overall, chondrichthyan extinction risk is substantially higher than for most other vertebrates, and only one-third of species are considered safe. Population depletion has occurred throughout the world’s ice-free waters, but is particularly prevalent in the Indo-Pacific Biodiversity Triangle and Mediterranean Sea. Improved management of fisheries and trade is urgently needed to avoid extinctions and promote population recovery. Dulvy, N. K., Fowler, S.L., Musick, J.A., Cavanagh, R. D., Kyne, P. M., Harrison, L. R., Carlson, J. K., Davisdson, L. N. K., Fordham, S.V., Francis, M. P., Pollock, C. M., Simpfendorfer, C. A., Burgess, G. H., Carpenter, K. E., Compagno, L. V. J., Ebert, D. A., Gibson, C., Heupel, M. R., Livingstone, S. R., Sanciangco, J. C., Stevens, J. D., Valenti, S. and White, W. T. 2014. 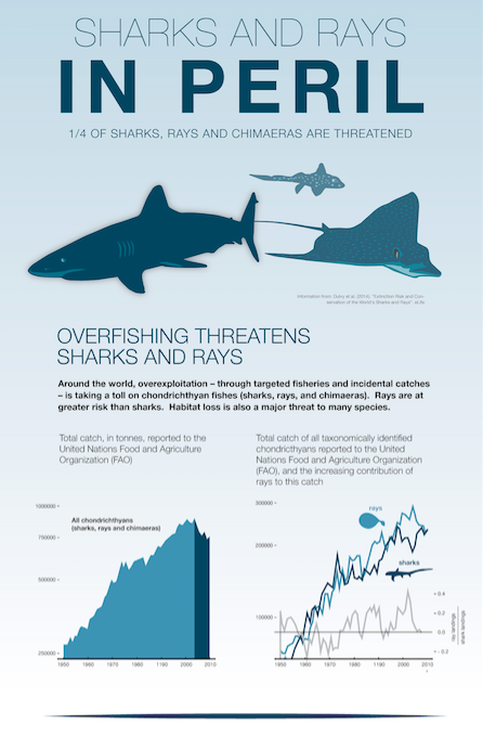 Extinction risk and conservation of the world's sharks and rays. eLife: eLife 2014;3:e00590. IUCN Press Release: This eLife paper was released at the start of the year marking the 50th anniversary of The IUCN Red List. The findings are part of the first ever global analysis of these species carried out by the IUCN Shark Specialist Group (SSG). YouTube Video Summarizing Findings: SSG Co-Chairs and authors on the eLife paper, Nick Dulvy and Colin Simpfendorfer, summarize the findings of the eLife paper in this short video abstract. The IUCN has developed "Amazing Species" profiles for the Giant Guitarfish (Rhynchobatus djiddensis), the Smooth Hammerhead Shark (Sphyrna zygaena), the Great Hammerhead Shark (S. mokarran), the Horn Shark (Heterodontus francisci), and the Dusky Smoothhound (Mustelus canis).